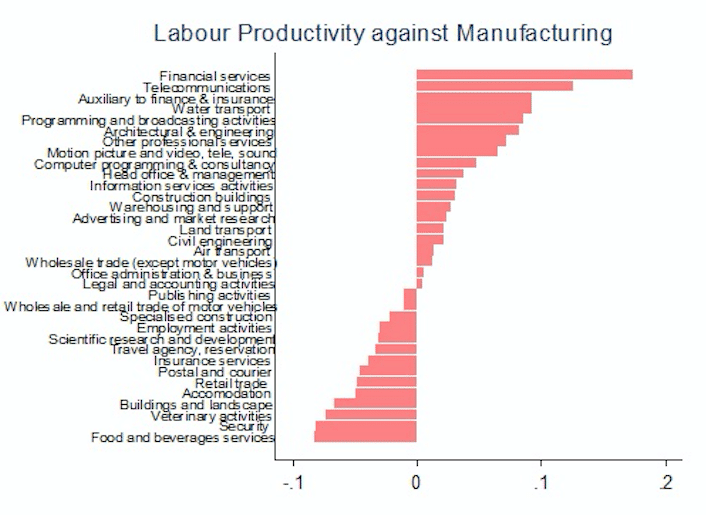 ECIPE > Blog > Sectors > Services > Are Services Really Not Helping the Economy? Bullocks! That is the conclusion that came to me when I participated in the roundtable conference on services and economic development in Tokyo last week. This conference was organized by the Asian Development Bank Institute (ADBI) and discussed with experts the positive role of services in the world economy. It’s high time for this discussion. In recent years there has been a slight backlash against services as a contributing factor to the economy, particularly for developing countries. One reason for this set-back against services stems from a recent article by Dani Rodrik in which he drives the point that many developing countries are de-industrializing faster than before and therefore moving into services too quickly. This premature deindustrialization, he argues, prevents them from using the manufacturing sector as a tool for rapid economic growth. According to Rodrik, in large part this is due to globalization and trade itself because globalization has produced changes in relative prices in advanced countries. This can have serious negative consequences for developing countries’ growth potential because, in the future, they would be much less able to capitalize on manufacturing exports. There are, however, a couple of remarks that in my view must be made here. First, these conclusions are most probably based on aggregate figures between countries’ services and manufacturing activities, which in great part mask the fact that many manufacturing sectors have already become “servicified” to a high degree. This means that a lot of gains by manufacturing firms are earned though services, not manufacturing. For instance, is Zara a garment manufacturer nowadays or just a retailer? Most probably it comes close to the latter. Such servicification is not yet picked up and properly classified in aggregate figures – and this is true also for developing countries. Second, there are surely economic meaningful sectors in a country’s services economy. The old way to look at services is that they don’t show a great economic role as they are not receptive to productivity improvements. That assertion seems to be out of date. Even though productivity for services is hard to measure, European micro-level data suggest that productivity varies hugely across services, and therefore their contribution to the overall economy is also varied. (see figure below). This should also be the case for non-developed economies. Source: Data taken from Van der Marel et al. (2015). Some services such as telecom, financial services and business services are much more productive than the average manufacturing sector. Over the years these sectors have also become increasingly tradable. Other sectors are still lagging behind, such as accommodation or security services, which are still in great part non-traded. In short, nothing suggests that services cannot contribute to the economy of a developed or developing country. In fact, when services become more tradable over time, and countries are able to export them, their contribution to the economy for all types of countries gets bigger. Third, although it is true that many manufacturing activities (i.e. stages of production) have been outsourced to developing countries, and therefore is a way for them to export these manufacturing activities (i.e. goods) through the global supply chains, this does not mean that services couldn’t do the same job. As most countries throughout the world are naturally expanding their services economy, parts of these services activities (i.e. stages of services processes) can in principle also be outsourced to other countries, many of which are likely to be developing economies. Rodrik asserts, however, that these services sectors are not big enough to give these countries a real boost. This might be true at first sight, but some numbers tell another story in my opinion. For instance, looking at European firm-level data of millions of firms across the continent, it becomes clear that computer programming, head office services, civil and basic engineering, postal and courier services and telecom services together (to name just a few) are as big as four important supply chain sectors, such as motor vehicles, metal production, machinery and equipment, and food manufacturing. In fact, thanks to supply chain trade and outsourced activities to developing countries these sectors have been able to grow over time. Therefore, there remains enough services activities to be outsourced to developing countries in the future, especially with the advancement of new technologies. Now, whether developing countries can truly capitalize on services activities, especially the ones which are mentioned above, will depend on one important thing, namely skills. One lucky finding is that, although generally exportable services are skill-intense, many developing countries have been able to export services with unskilled labour. Yet as sectors mature, many of these services activities will become more skill-intense, particularly in technology. In the longer term it is therefore crucial for developing countries to improve their skill base to be able to export more of these services activities.